Recombinant forms of multisubunit protein complexes can be generated by coexpression of their subunits in baculovirus-infected insect cells. Expression of all subunits from a single baculovirus rather than from several individual baculoviruses typically improves the correct assembly, stoichiometry and yield of recombinant protein complexes. This kit contains a complete set of biGBac cloning vectors that allow for the generation of baculoviral transfer vectors coding for up to 25 subunits of a protein complex in two Gibson assembly steps. This kit will be sent as individual bacterial stabs. biGBac enables rapid gene assembly for the expression of large multisubunit protein complexes. Weissmann F, Petzold G, VanderLinden R, Huis In 't Veld PJ, Brown NG, Lampert F, Westermann S, Stark H, Schulman BA, Peters JM. Proc Natl Sci USA. 2016 May 10;113(19):E2564-9. doi: 10.1073/pnas.1604935113. PubMed PMID: 27114506. The vectors in this kit allow for the generation of baculoviral transfer vectors coding for up to 25 subunits of a protein complex in two Gibson assembly steps. 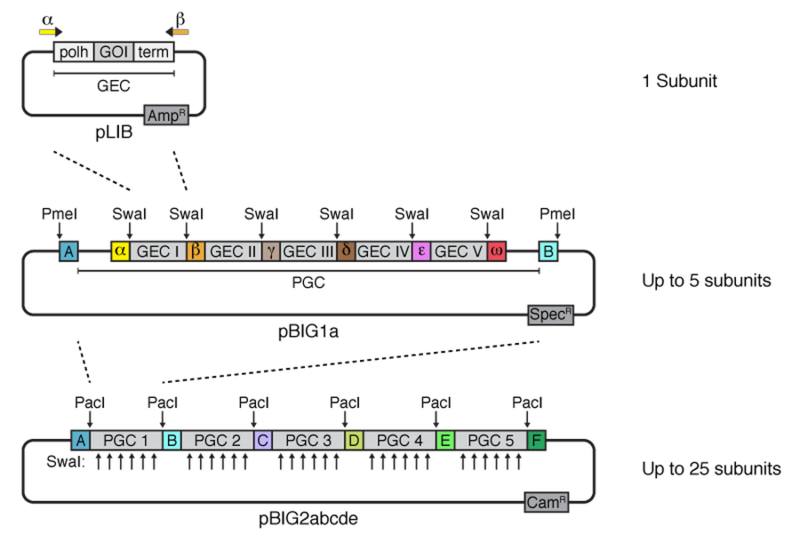 Schematic representation of biGBac expression vector assembly. Multigene expression vectors can be constructed within six days and the procedure can easily be scaled up for multiple expression vectors. Clones of multigene expression constructs can be conveniently analyzed by restriction enzyme digestion between individual gene expression cassettes (GECs) or polygene cassettes (PGCs). All biGBac vectors can be used as transfer vectors for the generation of recombinant baculoviruses using Tn7 transposition. Expressing Multi-subunit Complexes Using biGBac. Weissmann F, and Peters J.M. Methods in Molecular Biology (2018) 1764, 329-343. doi: 10.1007/978-1-4939-7759-8_21. PubMed PMID: 29605925.